Did you know that brushing your teeth properly and regularly could potentially help you live a longer life? Yes, that is absolutely true, and we are not exaggerating. Oral hygiene is crucial and directly affects our general health, which is why having the best electric toothbrush head for our electric toothbrush is important. Now, we all are well aware that electric toothbrushes are much better than their manual counterparts. These devices have the ability to do a fantastic job in half the time and effectiveness compared to a manual toothbrush. The most important part of an electric toothbrush is its head. Finding out which electric toothbrush head is the best for you can be very difficult. For this reason, we decided to help make your job easier. We tried out a variety of models and finally narrowed down the options to three best ones for you to select from. In case you don’t know yet, you don’t really have to buy electric toothbrush replacements from the same brand. These can often get too pricey. Hence, in such cases, you can opt for replacements that fit your electric toothbrush. Such replacements we are talking about are the ones from Sekmet. These toothbrush head replacements work perfectly with electric toothbrushes from Oral B and Braun (not the sonic range though). It comes in packs of four, which is enough for a small family. These four heads each have a band at the bottom in different colors to differentiate one from the other. If you and your family have sensitive teeth, then this set is perfect for you. It has very soft bristles that will protect both your teeth and gums from getting damaged, keeping you comfortable while cleaning them thoroughly at the same time. In addition, these heads are also designed in such a manner that their shape allows all the bristles to surround every single tooth, providing each one with individual cleaning. This also means that you get to enjoy superior cleaning power similar to what you will experience from professional dental tools. Using this electric toothbrush head is a far better option than manual toothbrushes because it can deliver up to 48,000 movements per minute. Manual toothbrushes can only go up to 600 movements in the same amount of time. As a result, you get a higher percentage of plaque removal. 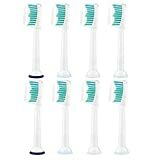 Reminder Function - The Bristles Will Fade From Blue To White To Remind You To Replace The Toothbrush Head (Recommend To Replace the brush head Within 3 months). Effective And Healthy - Using FDA Approved Dupont Tynex Bristle To Provide Effective And Healthy Brushing And Cleaning. Each Brush Come With A Protective Cap To Keep It Clean. More Eficient Cleaning - Our Toothbrush Heads Vave Designed Contoured Field Of Micropulse Bristles For Deep Clean In Removing Plaque And Defending Against Gingivitis. Money Back Guarantee - We provide 100% Satisfaction Guaranteed or Your Money Back Service. Next on our list of reliable electric toothbrush heads are the DiamondWhite Replacement Toothbrush Heads. These are yet another generic electric toothbrush replacements for electric toothbrushes. However, the difference for this one is that it is only compatible with the Philips Sonicare series. The DiamondWhite Replacement Heads are available in packs of five, and they are all of the same color. The bristles are embedded with the classic blue strip, which fades to white over time and use. This strip is meant to indicate when it is the appropriate time to change your toothbrush head. Each of the toothbrush heads comes with their own protective cap too. These toothbrush heads are designed in such a manner that it has the ability to get into the hard-to-reach places in your mouth, such as the back of the molars and the sides. 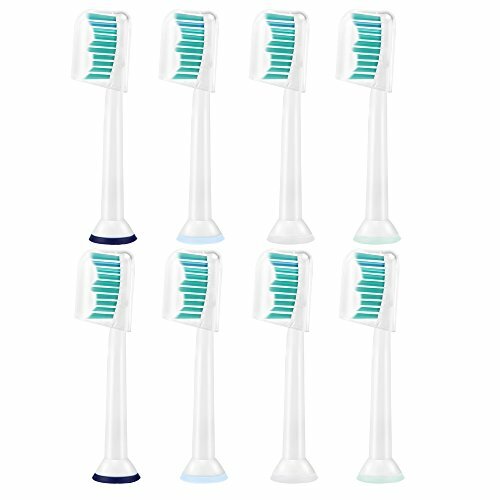 The bristles are specially designed and contoured to give a perfect balance of a comfortable brushing experience while effectively removing the plaque from your mouth. 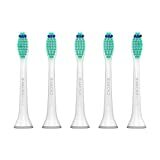 In addition, the company takes great pride in the fact that their toothbrush heads are a perfect fit for a variety of Philips electric toothbrushes. These work without causing any rattles or a loose fit. Choose this toothbrush head if you are looking to have sparkly white teeth without breaking the bank. The Oral-B Cross Action toothbrushes are famous across the world. In fact, the brand itself is considered to be the best in oral hygiene and is recommended by several dentists. So, for people who don’t want to compromise, choosing Oral-B’s own toothbrush head replacement is a great idea. These toothbrush head replacements are available in packs of three. Similar to the ones from DiamondWhite, all of these three come in the same color as well. 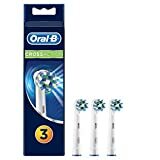 These toothbrush head replacements are perfectly compatible with the entire range of Oral-B’s rechargeable electric toothbrushes, which include both the oscillating and rotating ones. However, they cannot be used with Oral-B’s sonic electric toothbrush. What we truly liked about these Oral-B toothbrush replacement heads is that they have a cross-action feature. They boast very precise angles that have the ability to remove plaque from your mouth effectively. Without a doubt, these replacements do a significant job than a regular manual toothbrush. In fact, it is significantly better than several electric toothbrush heads out there. The shape of the brush head, along with its specifically engineered bristles, ensures that there is maximum tooth coverage. All of its bristles can easily reach between every tooth to remove plaque while keeping your entire mouth feeling fresh and clean. 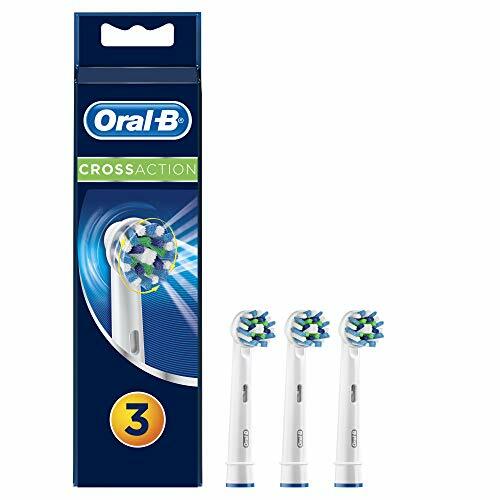 Oral-B CrossAction Replacement Electric Toothbrush Heads, features precise angles that target plaque to remove up to 100% more plaque vs. a regular manual toothbrush. Electric toothbrushes can effectively get rid of plaque and keep your mouth feeling fresher and cleaner as compared to using a manual toothbrush. For this reason, having the best electric toothbrush head is essential to maintain your oral hygiene. Among the three we have reviewed, we personally are a big fan of the Oral-B Toothbrush Replacement Heads. For starters, it is not a generic brush replacement but is manufactured by the actual brand itself. So, you can rest assured that it is built very well. 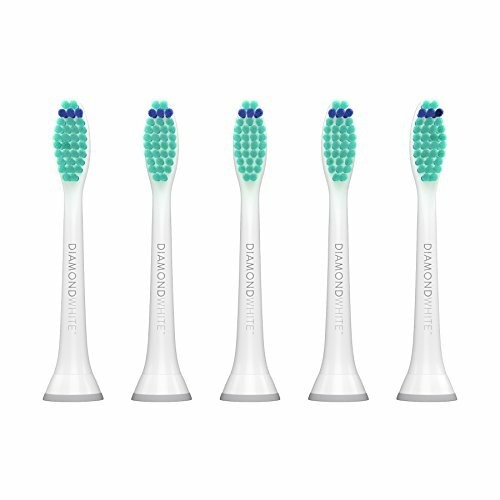 The unique shape of the head combined with the soft bristles ensure that they do a fantastic job in maintaining our oral hygiene.